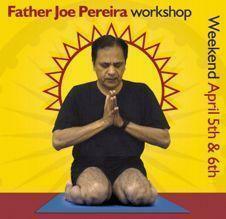 On April 4-6th, the renowned yoga therapist and addiction recovery specialist, Father Joe Pereira, will give a talk and hold a weekend workshop. Father Joe, the founder of the Kripa Centres, is a senior Iyengar Yoga Teacher and Catholic Archdiocesan Priest of Mumbai, India. Ordained in 1967, Father Joe started Iyengar Yoga in 1968, and became a certified Iyengar yoga teacher in 1975. He returns to Pune for intensive studies in yoga therapy with BKS Iyengar every year. Father Joe will give a talk on Friday evening, 4 April between 7:30 – 9:30pm. There’s no need to book for this event. Nothing can replace the presence, the voice, the assurance of one who has walked the path and can show us the way. In this workshop Father Joe will encourage you to develop your own wisdom and practice. The Kripa Foundation commenced in 1981 to help recovering alcoholics. The Kripa program combines the 12-step self-help program of Alcoholics Anonymous with other western and eastern strategies to create a holistic program for the person in recovery. The Kripa Program is formulated around Patanjali’s eight limbs and addresses the important emotional recovery needs of the addicted person. It has grown from a single centre to the largest non-government addiction recovery program in India. Father Joe is the director of more than 40 Kripa Centres in India and in 2009 he received the Padmashri Award from the Indian Government for his assistance to people suffering addiction and living with HIV.